Grandmaster Wong fells Chris, despite his heavier weight and bigger size, onto the ground merely by moving into a Bow-Arrow Stance! Chris attempts an over-head throw. Nick moves to a side and kicks Chris' ribs or kidney. Grandmaster Wong says that if Chris' foot is already on his body, he has to push it away, otherwise he may not move to Chris' side. Nick then applies “Bar the Big Boss”, followed with a strike on Chris. Even if both your hands are being held and the opponent thrusts his foot at you, either as a pivot for his over-head throw or as a kick at your chest, you can release the grips of both hands as well as deflect his leg using “Bar the Big Boss”. 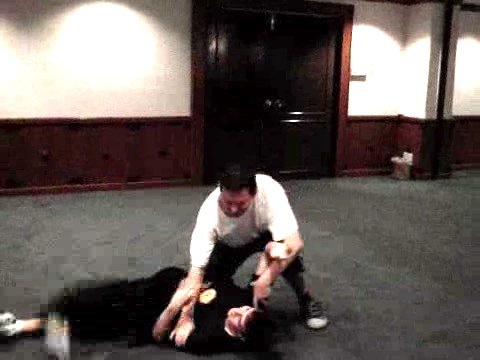 Notice that Grandmaster Wong covers Chris; hands as he strikes Chris. Nick applies the technique that Grandmaster Wong has just demonstrated. He releases the double grips and defect the leg in one movement. He also uses his bent leg to prevent any possible kicks from Chris. The size of the video clip is 0.35 mb. Nick and Chris try to throw each other as in Judo. Grandmaster Wong advices that they would have better advantage if they do not lean their body forward. Eventually Chris throws Nick. But although he is bigger in size, he does not use brute strength. His successful throw is due much to waist rotation and footwork. Grandmaster Wong again demonstrates the superiority of stances. He starts with a Judo poise but when Chris attempts to throw him, Grandmaster Wong sinks into his Bow-Arrow Stance and then Horse-Riding Stance, felling Chris in the process. His movement is somewhere between “Lead Horse Back to Stable” and “Tame Tiger Listen to Wind”. Kungfu is alive; one should not be too rigid with fixed patterns. The superiority of stances is again shown here. 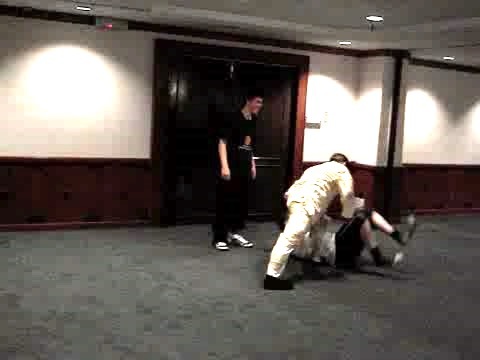 Chris attempts to fell Grandmaster Wong with a low leg sweep. If Grandmaster Wong stands with feet apart as in Judo, he will fall. But he moves forward into a Bow-Arrow Stance, felling the attacker instead. As Chris tries to sweep Nick's right leg, Nick lifts it up to avoid the sweep, and then places it behind Chris's leg to fell Chris instead. Grandmaster Wong explains that Nick can also fell Chris by moving his left leg forward, without moving his right leg which is being swept. This is shown in the next video clip. Chris tries to fell Nick by sweep his right leg. Instead of lifting up his right leg to avoid the sweep, Nick moves forward his left leg into a Bow-Arrow Stance to fell Chris instead, even when Chris is bigger in size. This is possible because of Nick's good stance. Some Unorthodox Felling Techniques Not Commonly Seen from Wong Kiew Kit on Vimeo.